溧阳路 is in 虹口区. dunno where Hanjing road is… or is it Hanyang road (汉阳路)? Haining road (海宁路)? Kinda looks like that famous optical-illusion painting of stairs. the one where you don’t know if up is down or down is up.. The photographer gave me the names in pinyin. I found 溧阳路 on a map, but I couldn’t find a “Hanjing Road” intersecting with it anywhere… 杭金公路 doesn’t intersect either. I e-mailed the photographer about it, so hopefully he can tell us the Chinese names too. Interesting pics, and a bit weird since I just helped out my girlfriend with an essay on Upton Sinclair’s The Jungle tonight! The photos were cool, but I don’t know, places like that scare the crap out of me. The pic where you can see Fei is especially troubling; looks like something out of a horror movie, 3 Extremes Part 3 maybe. “The Slaughterhouse.” You can almost make up a premise now. A Shanghainese man named Fei works at a slaughterhouse, but one day, begins seeing pigs’ faces where human faces are. He starts imagining his wife’s the leader pig and vows to kill her to stop his visions. He leads her to the slaughterhouse . . . You get the idea. Haining road is a main road in Hongkou, n intersects with Liyang road. i ve no idea about it either. havent been to Shanghai for quite a looooong time. Wow, good guess! Fei originally made a typo. I changed the text in the entry to reflect the correct location. I’m gonna make a run on this place today. Soylent Green is made of PEOPLE!!! I actually did make it back to this place, but it was “closed to outsiders” so I couldn’t go inside. Anyways, I’m coming back to this post because I just saw it on the news! They’re reporting that it was one of three such slaughterhouses in the world, and the other two in England and the US have already been torn down. 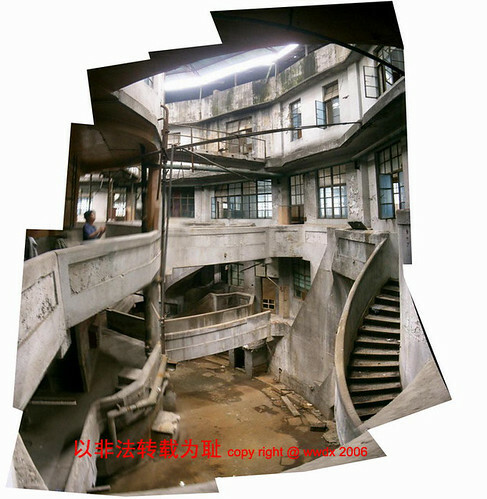 This one is now being renovated and turned into an artists’ colony and “innovation center”. The news showed mingong with sledgehammers banging away and the noise of electric drills ringing in the background, so… don’t get your hopes up. A 74-YEAR-OLD slaughterhouse is being turned into a retail market for luxury goods that is scheduled to open in July, project managers said yesterday. The new shopping center, called 1933 Old Millfun, will house jewelry and car shops as well as Western restaurants and other expensive outlets, managers said. “We want to give visitors a unique feeling in this unique construction,” said Zhou Jieyan, a manager with Shanghai Creative Industry Investment Company. It is turning into a commercial complex now. is it really! what do they slaughter??? They used to slaughter cows there.